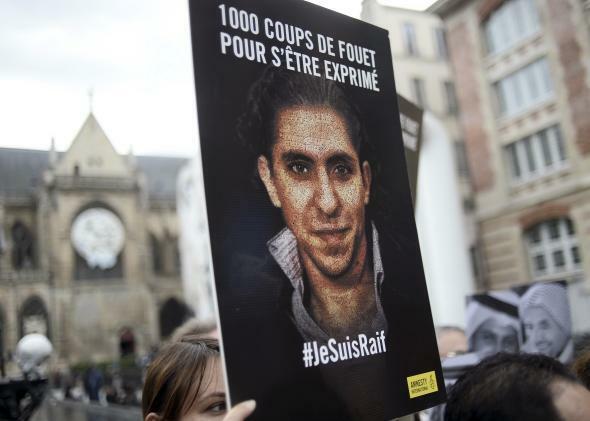 A Saudi Blogger Will Likely Get 50 More Lashes Tomorrow. His Wife Fears He Won’t Survive Them. People demonstrate in support of Raif Badawi, who was sentenced to 1,000 lashes for insulting Islam, on May 7, 2015, in Paris. The Saudi blogger Raif Badawi may receive a second set of 50 lashes tomorrow as part of his sentence for insulting Islam. The 31-year-old, who was first detained in 2012 and has been designated a prisoner of conscience by Amnesty International, was sentenced to 10 years in prison and 1,000 lashes last May for writings on the Saudi Liberal Network, a website he co-founded in 2008 as a forum for discussion on religious and political topics. He received the first of 20 sets of 50 lashes in January, but his sentence was then postponed on medical grounds when doctors determined he was unfit to receive more. This week Saudi Arabia’s supreme court upheld Badawi’s sentence, meaning that the weekly lashes can resume. According to Human Rights Watch, the lashings, conducted in front of a mosque in the city of Jeddah, are “generally carried out with a light wooden cane, and the blows are distributed across the back and legs.” Badawi’s wife, who has been granted refugee status in Canada, fears he may not be healthy enough to withstand another session. Badawi’s sentence has been widely condemned by human rights groups and foreign governments, including the United States, but it’s also a reminder of the uncomfortable fact that a government the U.S. considers one of its main allies in the fight against violent religious extremism is itself a leading perpetrator of violent religious extremism. This is only underscored by the fact that one of the kingdom’s preferred methods of execution, beheading, is the same as that of ISIS. The beheading of two men for drug trafficking earlier this month brought the number of executions carried out in the kingdom so far this year to 94, compared with 87 all of last year. The religiously based Saudi justice system is highly unpredictable: Widely varying punishments are handed down for similar crimes, and sentences can take years to be issued, carried out, or appealed. Whatever the reason, a writer may be brutally flogged tomorrow for nothing more than expressing mildly critical opinions about his country’s religious establishment.